Left: The Memorial of Soldiers at the Mansudae Grand Monument. Right: Retired Army Lt. Col. Stephen Tharp is pictured with his wife, Chang Sun, at a military social in 1988. Tharp has worked for the U.S. government for more than 40 years and has become an expert on U.S.-Korean affairs. Courtesy of Stephen Tharp. Raised by a father who was a career Navy officer who traveled the globe, the transition from high school student to United States Army officer seemed to be a natural progression for former Jefferson City resident Stephen Tharp. It is a journey, he notes, that not only carried him far from his Mid-Missouri home, but has unexpectedly led him to become an expert on relations between two nations. Born on Kindley Air Base on Bermuda Island in 1955, Tharp went through several moves as his father continued in his naval career. After his father retired in early 1965, the Tharp family moved to Jefferson City. 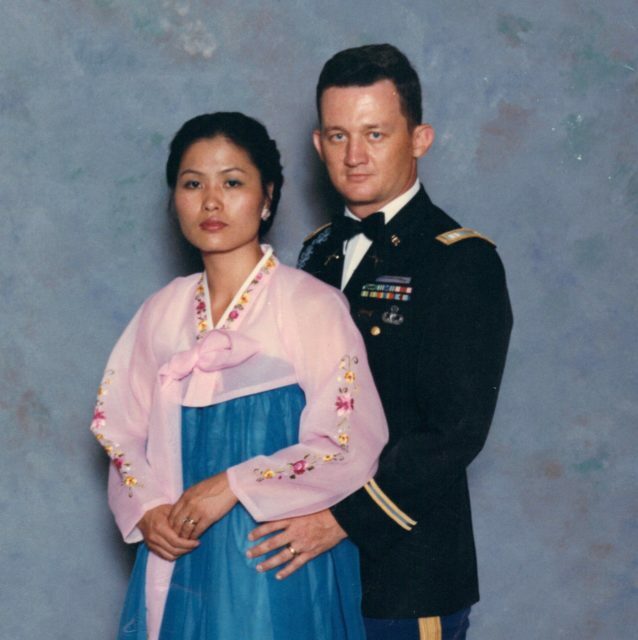 Retired Army Lt. Col. Stephen Tharp is pictured with his wife, Chang Sun, at a military social in 1988. Tharp has worked for the U.S. government for more than 40 years and has become an expert on U.S.-Korean affairs. Courtesy of Stephen Tharp. During his sophomore year, Tharp attended the U.S. Army Airborne School at Ft. Benning, Ga. The following year, while in his third year of college, he made the decision to leave school and enlist in the Navy; however, when he saw a poster in the recruiting office depicting a paratrooper coming down under a parachute, he was inspired to become a soldier in the U.S. Army. The aspiring soldier attended his basic training at Ft. Leonard Wood in 1976 followed by his return to Ft. Benning for advanced training as an infantryman. Though he contemplated leaving the Army, Tharp decided to remain in the service and went on to attend Officer Candidate School in 1982. Spending several months back in the United States, he returned to Korea and was assigned to the same light infantry battalion with whom he had previously served, except this time as an officer. While only a young, untested officer, Tharp led a number of combat ambush and reconnaissance patrols within the DMZ (demilitarized zone).Although he enjoyed serving as an infantry officer, he admits that the realities of age and injuries soon necessitated that he pursue a different direction in his military career. The next 4-1/2 years of his military career were spent primarily in school, where he learned the Korean and Chinese languages and earned a master’s degree in Asian studies. He then became an exchange officer at the Republic of Korea Army Staff College. 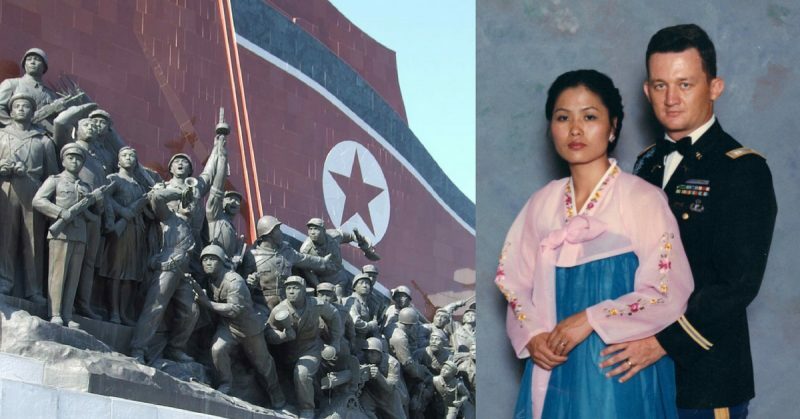 The Army officer further built his résumé as an expert on Korean affairs when he was appointed as a negotiator with the North Koreans in Panmunjom—a village north of the demarcation line between North and South Korea where the 1953 armistice was signed. His responsibilities continued to introduce him to many interesting experiences and altercations, some of which, he admits, were tense and considered quite dangerous. Tharp retired from the Army as a lieutenant colonel in 2004, remaining in Korea to serve as a civilian employee with the Department of the Army. He is now the chief of the Strategic Outreach Division in the Public Affairs Office of the United States Forces Korea, continuing to use his more than 40 years of governmental experience to represent the U.S.’s interests abroad. “It was never my intent to become an expert on Korean affairs,” he said. “In fact, it was probably more of a Yogism—whenever I came to a fork in a road, I took it,” he mirthfully affirmed. Drawing from his overseas experiences, Tharp has published two books about the Korean War and believes that by sharing such information it will help others to understand the ramifications of a war that has not officially ended.